GREATER MONCTON, N.B. 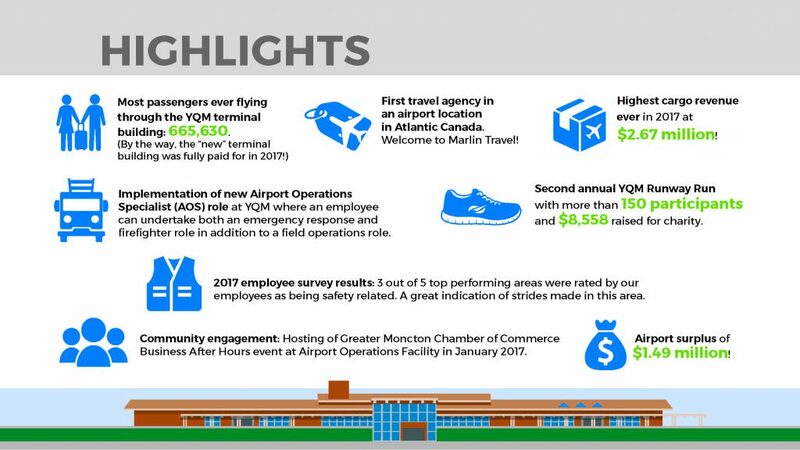 – The Greater Moncton International Airport Authority Inc. (GMIAA) held their annual general meeting on Friday morning at the Capitol Theatre lobby and updated the community and stakeholders on their main highlights of 2017. A second part of the meeting was a status update of the Master Plan findings up to now, a project to be completed this summer. “We’re very proud of our achievements this past year and we are looking forward to working towards our strategic goals for the upcoming year. With the Master Plan well under way and other projects like the carbon accreditation Level 2 that was just awarded by a worldwide recognized program led by Airports Council International, positions us well for another successful year.”, says YQM President and CEO Bernard LeBlanc. A copy of the annual report can be found at http://cyqm.ca/about/media-centre/annual-reports/. YQM is a progressive airport and the leading airport in the central Maritimes. 24/7/365 – everyone associated with the airport strives to provide superior air service to passengers travelling all over the world and to the global cargo industry -safe, convenient, efficient, bilingual and businesslike. YQM also strives to maximize its contribution to local and regional economic and community development – it currently drives over $665 million of economic activity annually, making it one of the top private-sector economic contributors to New Brunswick’s economy. YQM is a member of Vantage Airport Group.